Power your way to a leaner, slimmer beach body this summer with The Beach Body Bundle. Contains Metaburn Sports, Wheymax plus Shaker. The Beach bundle consists of Wheymax, Metaburn Sports Fat Burner and a Quality Shaker. Everything you need to get beach ready quickly. 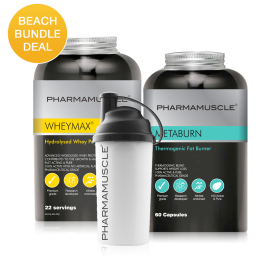 Prepare yourself for the beach this summer with Pharmamuscle's Beach Body Bundle combining Metaburn Sports and Wheymax. It is a perfect combination of fat burner and muscle gainer to help build muscle and lose fat for a perfect beach body. Metaburn contains ingredients that have been scientifically proven to thermogenically burn fat through natural processes and Wheymax has been independently tested and ranked highest for quality, taste and mixability. WHEYMAX is 100% Hydrolysed Isolate. By hydrolysing the protein in this premium formula,Wheymax is the fastest acting whey protein available. Hydrolysing breaks larger proteins down into smaller pieces that are able to get into your system rapidly, enabling your muscles to start rebuilding quickly. In addition, WHEYMAX is protein in its purest expression, It is made only with hydrolysed whey proteins that have been isolated to remove lactose, cholesterol, carbohydrates and fats. The result is a product that is ultra-pure, quickly digested and packed with muscle building and replenishing amino acids. Alongside this, we recommend that you have one serving of Wheymax between 2 to 3 times daily or as required.